How did this one fall under my radar? How is it Your Beloved Pachydermus and Shrine anime buff missed out completely on any news on this feature? 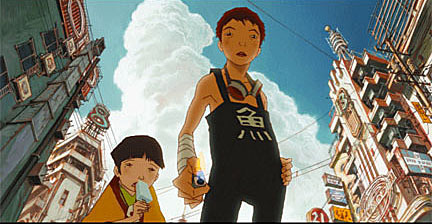 Tekkonkinkreet certainly bears an interesting pedigree: It’s the first anime feature I’ve ever seen that was directed and written by Westerners. Director Michael Arias and writer Anthony Weintraub tell us the story of feral street kids, Black, and his little buddy, White. Though they are not related, Black and White are brothers in every way except blood. Black is the eldest and more aggressive of the two, while White, dreamy and innocent, is perfectly happy to trail in Black’s wake as his accomplice and number one fan. The two boys form a street gang called The Cats, who have carved out a little niche for themselves in Treasure Town, and protect it fiercely against all comers. Up until recently they had coped quite well against gangs and ruffians trying to make names for themselves; come up against the two of them and get a stick to the head or a flying kick from off a power line 30 feet up. However, Black and White are not prepared for the fight they are about to face when Treasure Town is marked for gentrification by a mysterious robber baron, who would like nothing better than to “exterminate” the troublesome Cats. Add to those proceedings the boys being caught in the crossfire between the ravenous developers and a recently returned old-style Yakuza, who wants the town to revert to how it was when he left it. 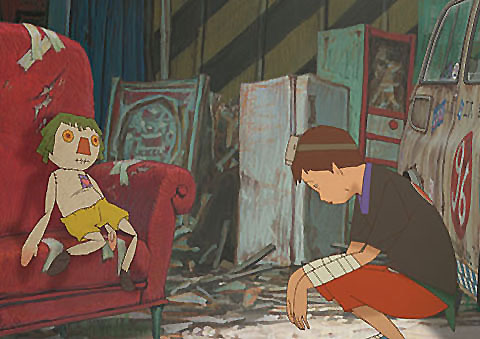 Can the two orphans keep their precious corner of Treasure Town? Can Black protect White from the outside forces that would tear them apart? Can White protect Black from the Minotaur, a street legend whose name sets fear into the hearts of the most hardened Yakuza? 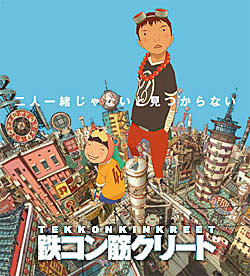 The most marked thing about Tekkonkinkreet is the character design. Kids, it’s ugly, just plain ugly, but for your own good, let it go. 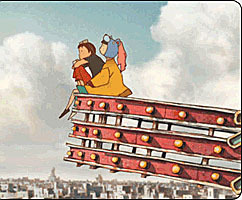 Having done a glance through the Taiyo Matsumoto manga, on which the film is based, the designs are not that far off; but that doesn’t make it any easier to watch. 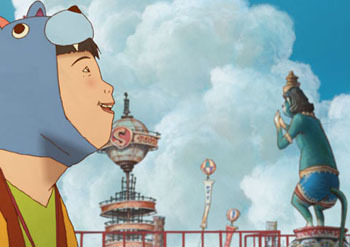 The characters of Tekkonkinkreet have strangely shaped heads and sketchily drawn features floating in them, almost like you’re looking at them through a fish-eye lens. There’s no attempt at cuteness or realism here, yet unexpectedly, the unfortunate faces register raw, relatable emotion. The roughness of the designs lends itself well to the roughness of the characters and the brutal doings of the piece, but for those used to the luxe, rounded, doll-like design of more typical anime (- Paprika, Metropolis, and even Akira, for example), the difference will take a lot of getting used to, but hang in, kiddies, it’s worth it. 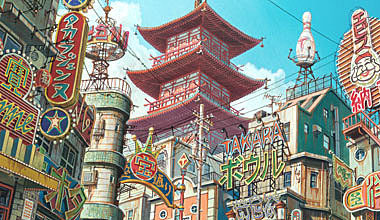 The vividness of the Treasure Town backgrounds in daylight resemble those of Miyazaki’s Kiki’s Special Delivery or Howl’s Moving Castle, only pressed flat and claustrophobic with almost no depth, which is a statement in itself. When we see Treasure Town at night, it is radiant and luminous, glowing in murky, artificial light and rich, dark, sepia tones, its towers overlooking an endless abyss below. Treasure Town’s waterfront buildings are packed up against each other in different styles in varying stages of repair. Some of the structures resemble the BBC Tower, the 1964 Flushing, Queens World’s Fair Unisphere, and sardine-packed Hong Kong apartment buildings jammed side by side. A very special mention has to go to the clock tower that’s a hybrid between Big Been, a Hindu Shrine and a pachinko machine and features Your Own Dearest Elephantine Deity serving cuckoo duty. I enjoyed the don’t-blink-or-you’ll-miss-them nods to Ultraman, C-3PO, Mogera, Tetsujin-28 (- that’s Gigantor, to you, Gai-jin! ), and the RCA Victor dog, among others. 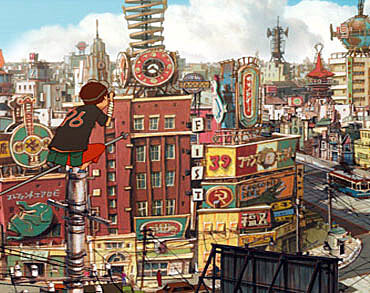 This is a movie you can watch again and again and always find new things to admire. Arias lets the viewer know that while there is meant to be a homogenisation of cultures in Treasure Town, you’re still in Japan, Toto. His rooftop amusement parks, temples lined by vendor’s booths and blindingly lit pachinko parlors are emblematic of Japanese city life. The faded colours of the back alley Black and White call home (- they sleep in a beige Mini-Cooper) are more a state of mind for the boys for whom savagery is the only means of survival they know. The compelling heart of the story is that savagery and the way Black takes it all on his shoulders while doing all he can to protect the impish White from it. White is Black’s heart and soul and his balance. White’s inability to see their situation in a dark light and his insistence for Black to “be happy”, despite all the despair the two orphans face every day is Black’s only link to sanity. Black does what he needs to protect them both and their tiny patch of the world from encroaching destruction. There is a lot of rock ‘em, sock ‘em action here, folks. I don’t know why Black and White can flip over buildings and fly through the air, but it looks really cool when he’s fighting the Matrix-like goons of the robber baron for whom the brutal murder of small children is nothing. Black is very much like Neo meets the Feral Kid from the Mad Max series, and when White goes missing from his life, lets that ferality take over. 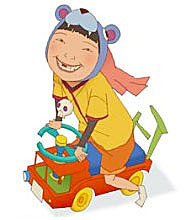 He becomes a vicious, wild thing, neither boy nor animal, terrorizing Treasure Town, completely unbalanced, walking the streets talking to himself about White. His meeting with the Minotaur is the stuff of myth, with Arias pulling out the stops for this head-tripping sequence which calls to mind the works of Edward Munch, Monet, Egon Schiele, and Goya in his loopy phase, lit through a lava lamp and intercut with graphic frames worthy of the darkest Dark Horse broodings. He’s in a fight for his soul and the only one in his corner is his runny-nosed, gap-toothed little pal (- whose collection of the best hats, ever, causes Ganesha ungodlike envy!). Arias’ mode of storytelling has a linear-ness to it that you don’t normally see in anime features. It was refreshing to simply be told the story without having to allow for mind bending leaps of reality (- other than why the boys can take flying leaps everywhere, and where exactly does one buy a pack of alien goons?). It allowed the audience to simply appreciate the plot and the depth of the connection between Black and White. You can get lost in some of White’s watercoloured impressionist dreams, which show us the purity and innocence of his soul. Speaking about Black, White says, “When he hurts people, I tell God we’re sorry”, there’s no saccharine, it’s just who White is and that line captures why he’s so crucial to Black. The bond between the boys and the struggle and sacrifices they face to keep each other alive is both touching and real. A special note about the soundtrack, which comes to us through the auspices of London electronic wizards, Plaid. The score, innovative, restrained and utterly perfect does exactly what a good score should and heightens the action and mood of the proceedings. Black’s fight scenes pulsate with a tribal rhythm and the music throughout the film plays upon the notion of a homogenized world, using sitars and eastern melodies. Plaid creates a skein of atmosphere as involving and important as any aspect of the story. 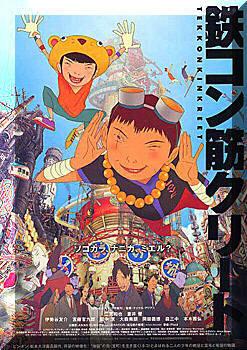 Tekkonkinkreet is a different herd of elephants, kids. While the unusual look of it may put off those who aren’t fans of anime or animation, it’s a fantastic payoff for those who give it a chance and stick with it for the whole ride. It’s a departure from your Grandma’s anime, and a very welcome one. 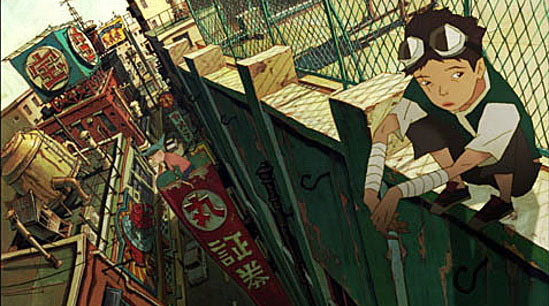 While the field of new and innovative anime features has slacked off a bit since it’s heyday in the 80’s and early 90’s, to see this new film created through a collaboration between East and West gives me high hopes for the future of anime, which compels me to leave you with White’s favourite phrase, “Be Happy, Be Happy”.